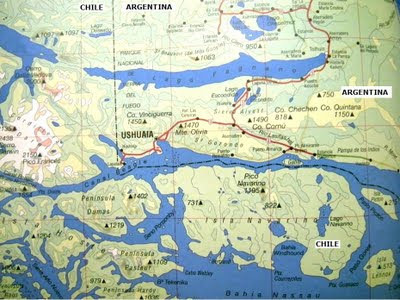 Map showing Beagle Channel and Lake Fagnano area of Tierra del Fuego Island. I include it because in a previous post I mentioned Hoste and Gable islands (the first is at the bottom left side of the map, the second is in Beagle Channel right beside Harberton -the home of the Bridges family, the first settlers in Tierra del Fuego). In future posts we will mention Yosi, a horrid Fuegian dwarf, who lived by Lake Fagnano, which is also home to Fañanito.